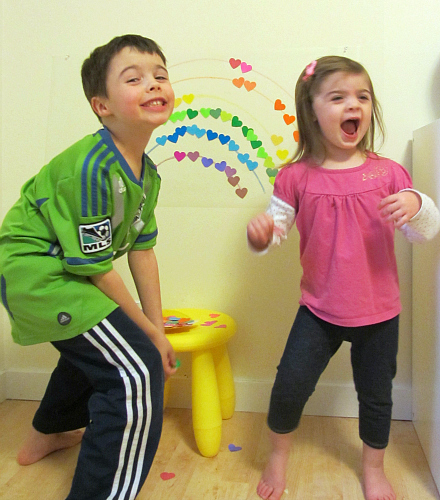 We needed some extra happy cheer in our playroom after a week of cold, gloomy weather. 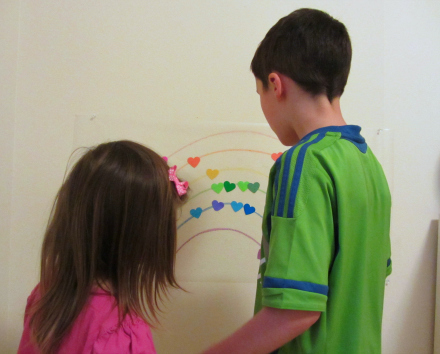 My kids had fun making a cheerful rainbow wall for their playroom while working on fine motor skills, color recognition, and counting. Oh, and cooperative projects like these were always the very first thing I’d set up for my class (and now my kids) when bickering started popping up. 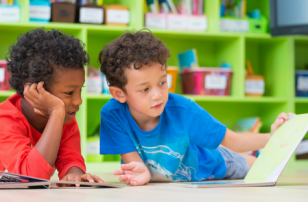 Working together has a great way of allowing them to work out their differences and feel like a team again. Gather your materials. 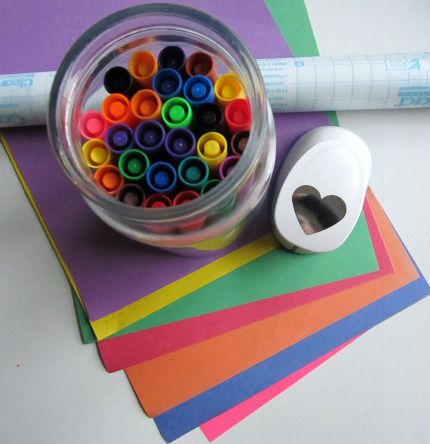 You will need some contact paper (or craft paper with double stick tape), many sheets of all different color paper, a heart punch, and markers in every color of the rainbow. 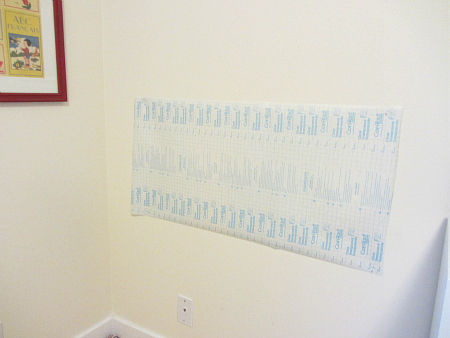 Start by pinning the contact paper to the wall sticky side out. 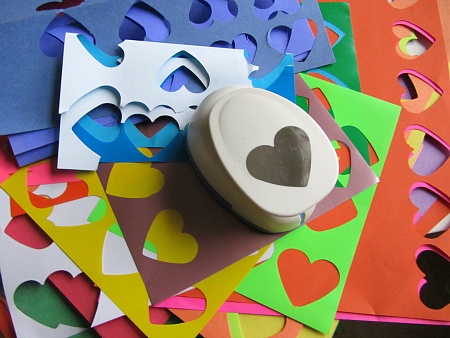 I prefer contact paper because it allows kids to change where they put a heart if they don’t like their original placement. Pop the paper on with the backing still on then peel. I find it way easier than putting in on with the sticky already exposed. Next, punch out a whole bunch of hearts. My kids helped with some but I did most of the punching. 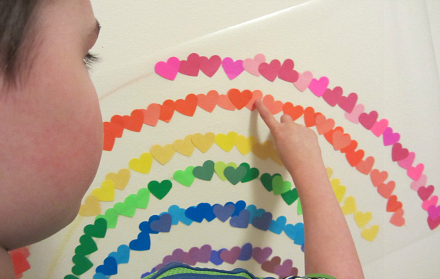 Draw the rainbow with markers directly on the contact paper. 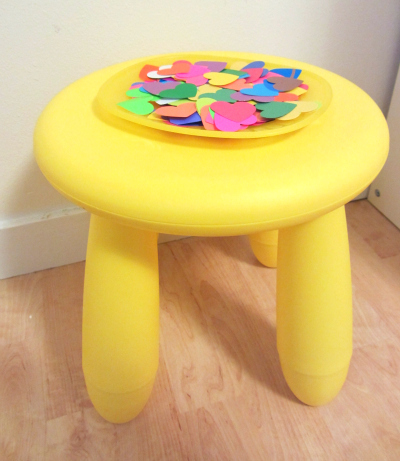 Set up a heart station (ours was a plate and a stool) by the contact paper. Let them at it. 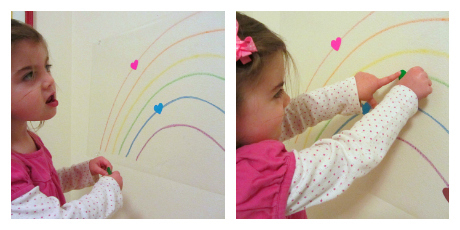 My daughter liked taking her time finding the exact right spot on the rainbow wall for each heart. My son liked gathering a handful of one color and adding them on in a bunch. Clearly, they weren’t having any fun at all. 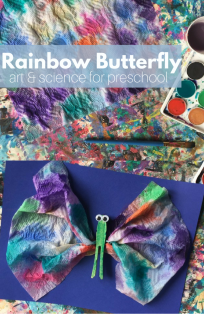 My daughter fizzled out about halfway through, if I was making this for just toddlers I’d make a much much smaller rainbow and maybe larger hearts as well. My son and I had a race to see which colors could be filled in first. I was reminded how much I love just working on something like this with my kids. It really does make you feel more like a team and is by far the number one reason we do projects together. He counted each color to see which won and noticed that, of course, the first few colors would have more than the last few. 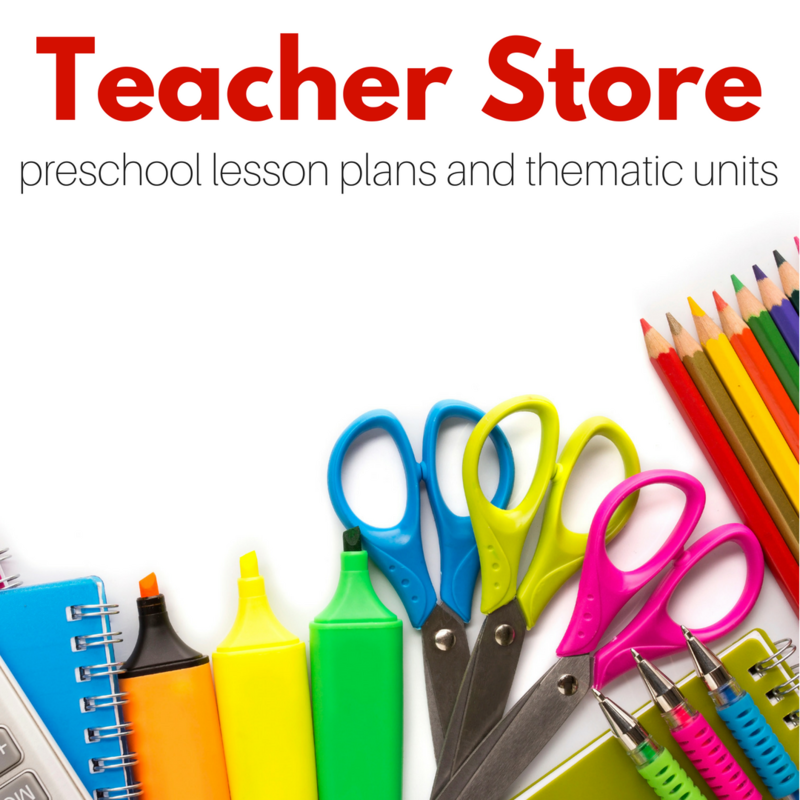 I love it when learning like that comes so naturally in a self-directed way. Rainbow wall is all done. Now our gloomy winter weather can’t bring us down. 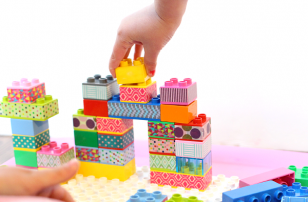 My kids need some teamwork activities. Love this Allie. I may have my son cut out some big hearts for the toddler. Our walls need some color! oooh! i’m loving this idea! thanks so much for the great idea 🙂 i’m going to pin this, too. I LOVE this idea!!! I cannot wait to try it with my kiddos. You never cease to amaze me with your creativity. This is so cute! 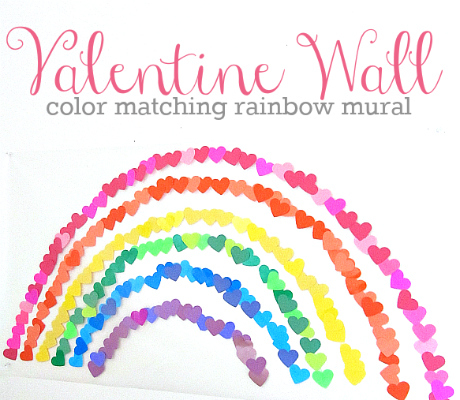 I like the variations of color in the hearts too – gives it cool dimension. I thought so too – I didn’t mention it in the post but we had quite a debate about where pink should go as well as where a certain shade of blue/purple should go. It was interesting and more importantly thought provoking. What a great idea. It looks fantastic as an end result too! I love this so much, and am going to do this with my 5 yr old for our 100th day of school project! I am banging my head on my keyboard – that is such a great tie in ! Why didn’t I think of it?? Awesome. Love this idea! Just one Question: the hearts dont over the whole contact paper, so surrounding the hearts the paper is still sticky, am I right or did I misunderstood the steps? you could add another sheet of contact on top to get rid of the sticky – or like I’m going to do – stick it to a window! 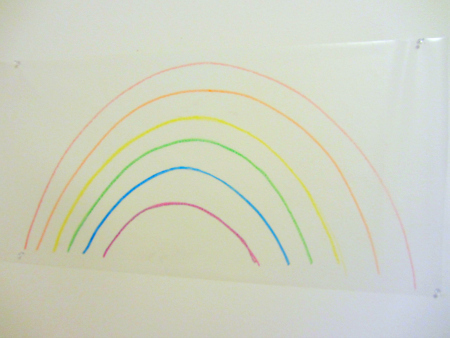 It would look great seeing this rainbow on the window every day! This is so incredibly cute. 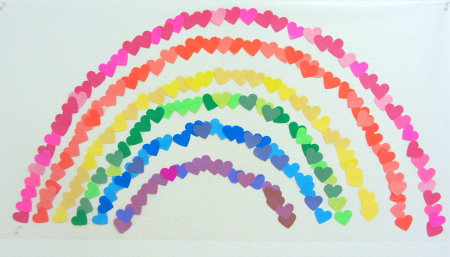 I love all the little, colorful hearts! What a wonderful idea! I’m going to try this with my 4 year old! I love this! It is beautiful, and so many teachable moments with this wall. Great idea. 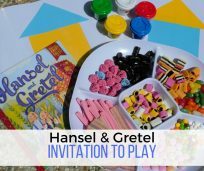 We had a great time doing this activity. Thanks for the inspiration! 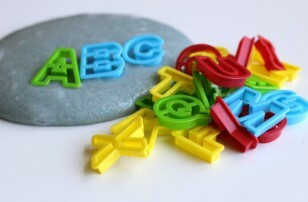 Wouldn’t you want to put another piece of contact paper over the top so it is not sticky? I could see my kids sticking all kinds of things to it if it is left sticky. Do you have any suggestions for that or just another piece of contact over it? 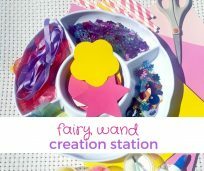 I do love this idea, my 8 and 4 yr olds will love making this! Thanks! You could but that’s a LOT of contact paper which gets pricey. My kids never add stuff to it after the fact and this one was up for 7 months! Sorry for the above comment! I just looked at a piece of contact paper and it looks like only one side is sticky–not both. That answers my questions! Thanks! 🙂 I should add that good quality contact paper tends to take paint with it in my experience if it’s left more than a few hours.